Great Cocktail Recipes: Drink Responsibly! You do not want to get a DUI or get completely s*it faced! Drink Responsibly! You do not want to get a DUI or get completely s*it faced! I know this is a fun place where you can learn about awesome cocktails, differences between alcohol, and how to get the bar vibe started, but realize....you should do this in moderation or less. And you should be RESPONSIBLE while you sip. Don't drive while drunk or intoxicated to the point where your movements are questions....don't get completely shitfaced at the bar to the point where you want to cause trouble or make unwise decisions....and definitely be careful at parties where they serve Jungle Juice or even Long Island Ice teas. 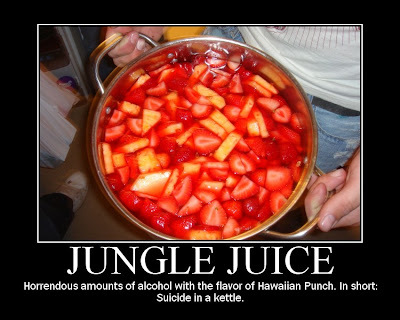 What's a Jungle Juice you may ask? Well, normally, you'll see these at a bunch of huge parties (social gatherings or more typical college parties esp frat parties or house parties) where you mix high powered liquor like a Bacardi 151 (Rum), Everclear (190% Grain Alcohol) typical mixed with fruits and Hawaiian Punch. However, if you check out the link from earlier we add in a lot more stuff to make it taste better. Later, I'll do a post on some of the best jungle juices/frat punches I've seen on YouTube with recipes, probably. At any rate, here are a few reasons why you don't want to get shitfaced. One, regarding underaged drinking; two, regarding getting shitfaced at the club; three, regarding getting a DUI. On Thursday, I'll be posting some awesome shitfaced recipes...Be on the look out for that and when I make my long island iced tea! Enjoy!